What's better than a beer from 1911? Two beers from 1911! Oh yes. No details yet as I've only seen a post on a facebook but no doubt inspired by the lad's historic cup run The Draft House have made a beer called 1911, which I'm sure will be eagerly anticipated by Bradford City fans the world over. I've recently had some glimpses into the world of normal beer drinkers. A thread on a climbing forum asked "what's the worst brewery?" and the answers weren't quite what I expected. That Black Isle got a mention was the first surprise, but then they did have an infection problem at one point. 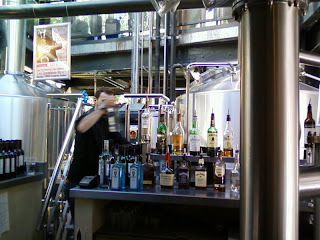 Then Brewdog were mentioned, but they do have quality issues and some of their beers won't be to everyone's taste. 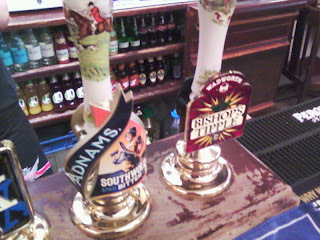 But when I saw Thornbridge listed I didn't know what to think. I can't remember a beer geek every complaining about them, except me about some of their prices that is. Then down the Crown I heard that Windsor and Eton Kohinoor, a bitter IPA with a strong new world hop flavour, was selling slowly. Soon after I heard another brewer complaining how much Doom Bar was sold round his way. All I could think was, well, that's just how the world is. Outside of beer geekdom there are a lot of people out there that don't like full flavoured and assertive beers. It's not just that they're happy to drink mildly flavoured beers, the don't actually like ones which aren't. As beer geekery tends to the extremophile end of things it's good to be reminded that most people stay away from the hop springs and drink in milder climates. On Saturday we had a research trip to Reading, something I've been meaning to do for some time. 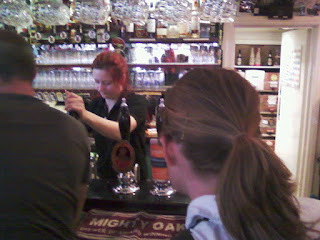 We started at The Ale House, a pub which lived up to its name with plenty of hand pumps. It's a small place, but we managed to find some seats in a cosy little alcove and settled in with pints of Mr Chubb's Lunchtime Bitter, an old favourite. We were waiting for another friend here so we had time for two. The lovely Lisa stuck with Mr Chubb, but as I used to work with Mr Bingham I moved on to his Twyford Tipple, which rather surprisingly had a touch of the Harvey's about it. 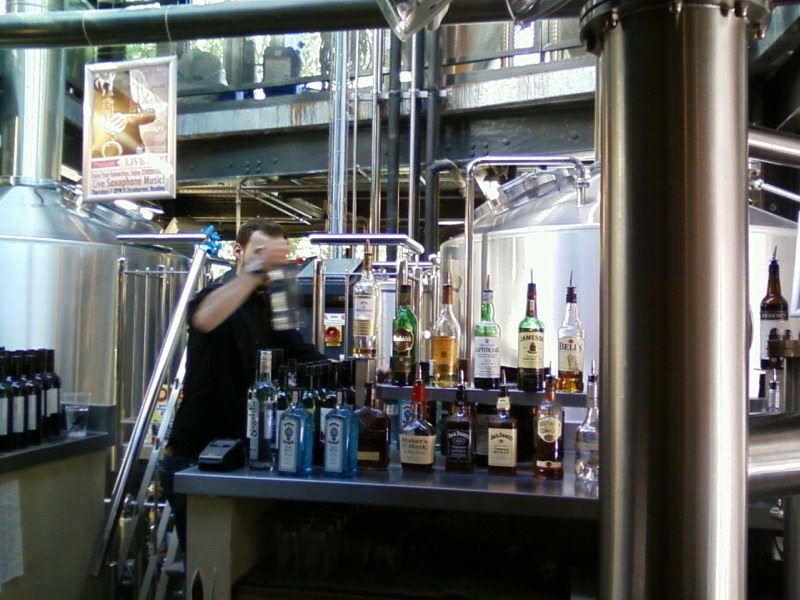 Zerodegrees was the next stop, it's part of a small chain of brewpubs. Though having said that it's more a bar than a pub and had loud beepy music playing so it wasn't to my taste. 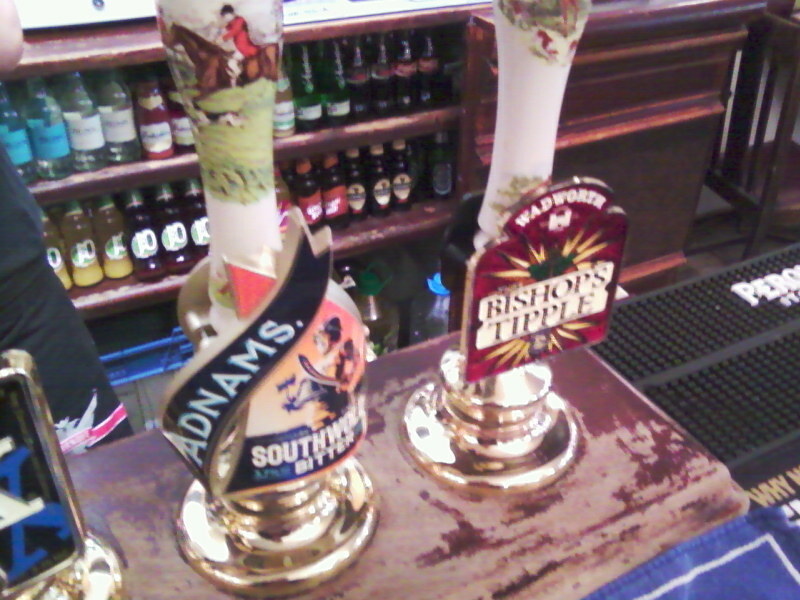 The beer's are some sort of CAMRA kosher keg but my hazy pale ale was fine and the smoked beer and wheat beer seemed to go down well too. 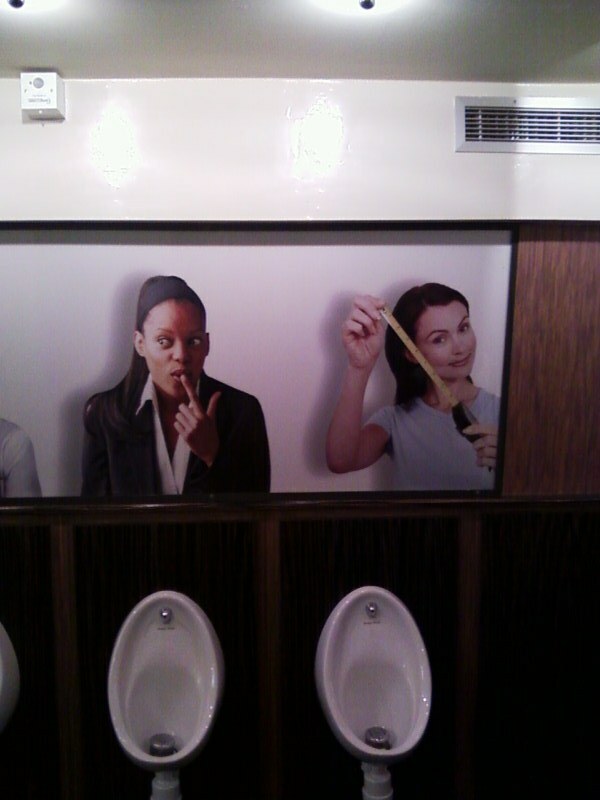 For some strange reason above the urinals they have pictures of women mocking your manhood, not sure what that's all about. 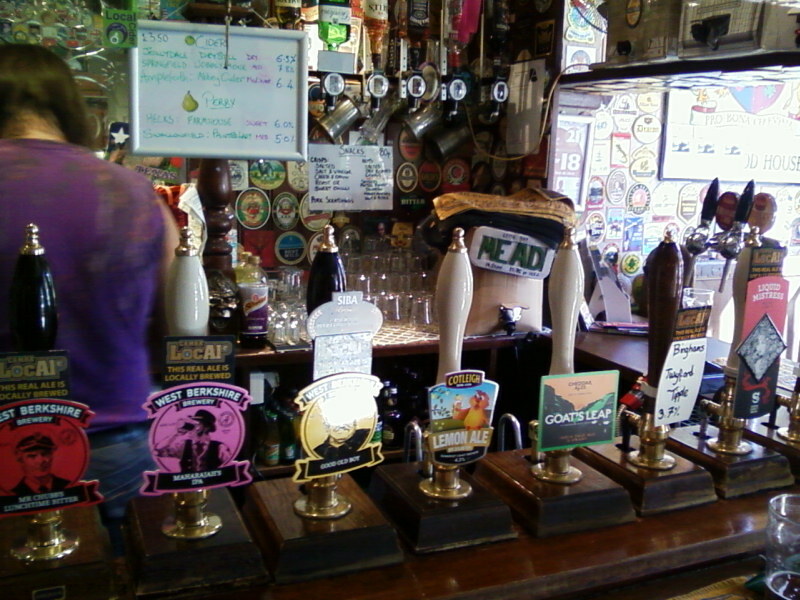 It was time for a pie after that so we called in at Sweeney and Todd's, a restaurant with four beers on hand pump which mightily impressed me, even if the beer range was on the unexciting side. The food was very reasonably priced too. Ready for more research after dinner I was delighted to discover another protestant sect as we waddled towards the last pub. This lot were homophobic Anglicans. I've never looked into C of E splits before but I've now got a whole new series of schisms to read up on. 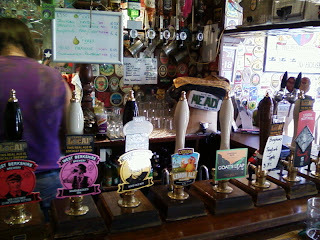 Our last stop was the Nag's Head, which had an impressive 12 cask beers on. 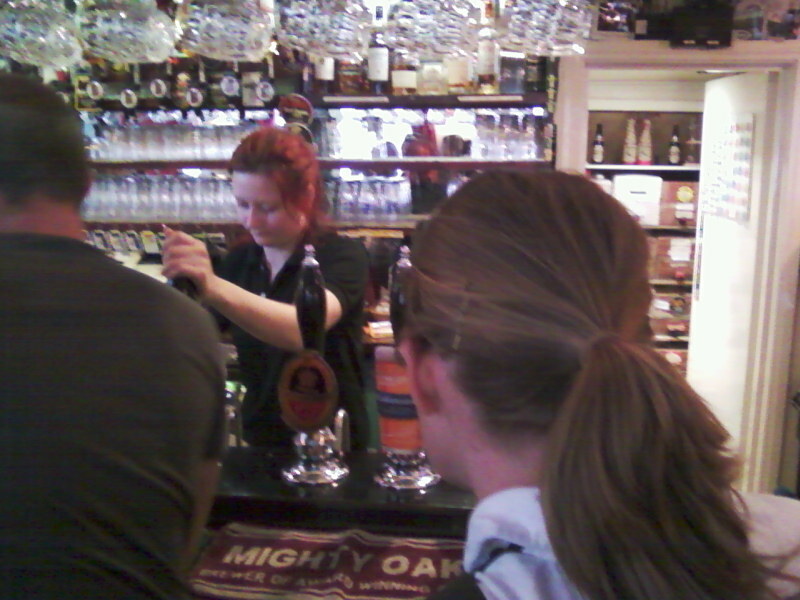 I spied Gadd's Old School Mild, which made the choice easy. Surprisingly hoppy for a dark mild I still enjoyed it even if I didn't get what was Old School about it. The pub was one big room with bare floor boards, which isn't really to my taste but I wasn't fussy by this stage of the proceedings. All that was left after that was to wend our way home, with refreshment from the M&S at the station sustaining us for the train journey. The great wealth of information in the archives of the Journal of the Institute of Brewing has been a source of delight to me, but it also sent me into a temporary depression. I'd recently put some effort into tying up the loose ends of that most vexing question "what is a Goldings hop? ", and felt some satisfaction that I now had the definitive answer on all ten of the varieties of Goldings. If this is the case then even buying East Kent Goldings won't guarantee you're getting real Goldings free from any interlopers. After much wailing and gnashing of teeth (I might even have pulled some hair out if I had any to spare) I resolved to investigate this calamitous calumny. As it happens I should have done this straight away as a quick look at Percival showed Cobbs were selected from a garden of Canterbury whitebines, and so like all true Goldings differ from Farnham whitebines only by mutation and not by breeding. Phewb! I have since had it confirmed by Peter Darby that Cobbs really are a true variety of Goldings. Quite what caused the terrible travesty that left them languishing in a lower league for long years I couldn't say, but we can at least take comfort that they now reside where they rightfully belong. * If you don't understand what I'm wittering on about Golding variety is the name for the second division of English hops, not considered as good as the varieties of hops that make up the true Goldings. And for those of you too young to remember the second division think League Championship .